Please refer to our stock # 11104 when inquiring. This lovely bracelet was made by the Italian design duo of Lyda Toppo and Bruno Coppola, better known for their label, Coppola e Toppo. The bracelet has a wearable length of 7 1/2" and is 1 1/4" wide. 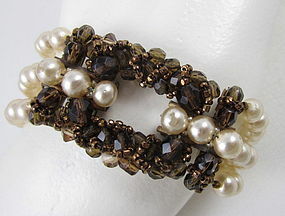 The clasp and medallion have brown faceted crystals with a triple row of glass faux pearls. On close inspection, there is some chipping of the pearl nacre, but it is not noticeable when worn. The clasp is hallmarked "Made in Italy" and the medallion is signed "Made in Italy by Coppola e Toppo".